I’m completely charmed by the aesthetic of this game. I thought Kirby’s Epic Yarn had topped out what you could do with craft-based video game art, but I was wrong! The little details are what really brings it home. 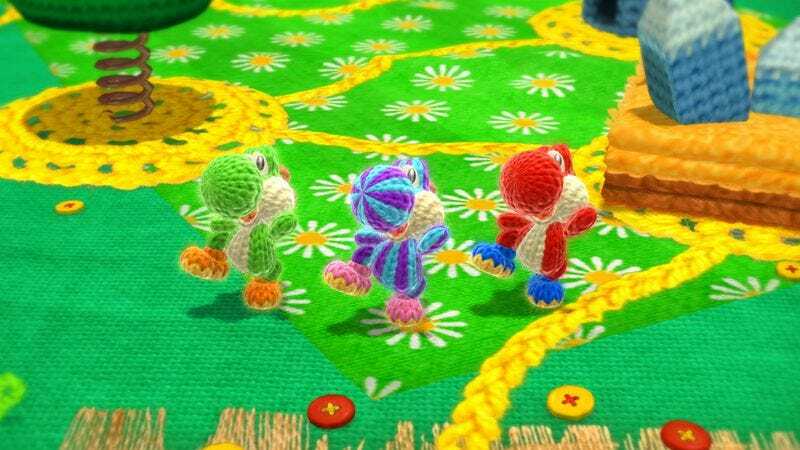 Where Kirby’s Epic Yarn mostly employed your typical stockinette stitch or a colored fabric with thread for the stitching, Yoshi’s Woolly World is employing all kinds of patterns to create their landscape and items: Yoshi himself is crocheted; the tree trunks alternate knit and purl stitches to bring out the texture of the bark; unraveled enemies turn into balls of yarn, which is how you would collect it when you tear out a botched scarf or whatever; and the hidden yarn items are happy little skeins, just like you would buy at the store! I can’t wait to see if they have some sort of cable-knit level! And taking a closer look at some of the textures, I’m really appreciating that they added some mistakes and uneven stitches to the environments. Unless you’re a master knitter (or super neurotic about it) there’s going to be at least one dropped stitch in a big project, and it takes tons of practice before you can work with consistent tension on the yarn over a large area. They could have taken the easy route and used a simple repeated texture for each object, but by adding imperfections to the set pieces, they’ve imbued the world with a handmade feel on an almost subconscious level. I loathe this design philosophy. The levels are so short and quick and easy, and it feels like the concepts they introduce never get a chance to really breathe. Since they are only used once, you never get to see them taken to the logical places they could go because their forgotten by the next level. 3D World seems like such a huge step back from Mario 64 and Sunshine. The worlds in 3D World felt like they’d been cut from a small bit of an actual full level from the previous games, like if instead of the full first level of Mario 64, you just cut out that mountain where you dodge the boulders while climbing and presented it as its own stage. I dislike the idea of level theming entirely—well, “traditional” level theming, anyway, the kind where you need a desert world, a snow world, a beach world, a cloud world, a world where everything is an instrument just to make the “nature theme” theme not work anymore. Something I loved about Mario Sunshine, and I’ve said it here before: There was none of that. Every world was beach world, basically. And by giving the game a sense of place, it made more of a “World” than 3D World ever did. That is an interesting perspective to hear, since it’s radically different from my own. Super Mario Sunshine is my least favorite Mario game, partially for the reason you provided: It feels a bit too samey. I prefer the diversity of Super Mario Bros. 3 or Super Mario 3D World. I wonder, though, if the Super Mario Galaxy method is best, where each level is a unified set of challenges that is neither part of an overall theme nor a world theme. Keeps it fresh, I guess. I’m kinda thankful I missed the gist of this relationship when I played. I do remember having to put stars back in the sky, but I forgot both the why and the veiled insults I received along the way. I’d rather have the tacit approval from my stoic yet respectful father than this. Seeing this, it makes the actions of the Prince all the more destructive and chaotic. Peoples’ homes and cities were systematically dismantled to make up for this “benevolent” god’s carelessness, and for nothing more than some vague, back-handed approval. He may be unlike Yahweh, but the King still allowed the Prince’s destruction on Earth as an attempt to compensate for his own failures to care over his dominion. I played “unlimited” mode. I rolled skyscrapers, the clouds in the sky, and the very land itself into a ball, leaving nothing but ocean. How was this not like the Great Flood? The stars shined on a dead world, with no one left to appreciate them. At least Yahweh saved some living creatures to repopulate in his name. And that does it for this week folks. As always, thank you for reading and commenting. We’ll see you all next week!